National Quit Day is right around the corner. . . will you be ready? The costs of not acting now are not just financial. 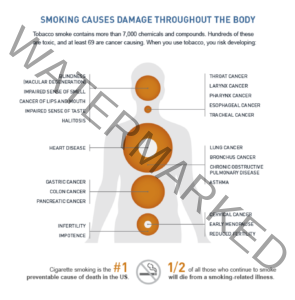 Check out what this deadly habit is doing to your pocket using this Cost Calculator and then observe what it’s doing to your body below according to the American Cancer Society. Is it really worth it? The time to STOP SMOKING is NOW and enjoy the benefits of a healthy smoke-free lifestyle. Smoking is a life threatening habit and one of the leading causes of cancer. WebMD advises that smoking increases your risk of heart attacks, strokes, lung disease, and other health problems, including bone fractures and cataracts. If other smoking cessation methods haven’t worked for you, NOW is the time to try hypnosis. Each week, you receive 1 in-person hypnosis session and 1 hypnosis recording to listen to every day until the next session. So that’s 4 in office sessions and 4 recordings. The program is offered as a package discount of $600 and payment is required in advance. No other discounts apply. What do you have to lose but that nasty habit? BOOK NOW and discover how hypnosis will help you. . . Address your feelings and beliefs about smoking. Develop and strengthen your will power to be smoke-free. Receive positive suggestions to decrease cravings. Program success and prevent relapse. Affordable, fast, effective, and easy. Supportive, safe, comfortable, and confidential.